This cable will connect the Dragon Link Transmitter to ALL models of Specturm, JR, and any other brand of RC transmitter that has a mini type audo pluge DSC or trainer port connector. Look at the picture to see the connector. RC transmitters with this type of DSC / Trainer port do not output power, and you will need to connect power to this cable by one of two avaialbe methods. 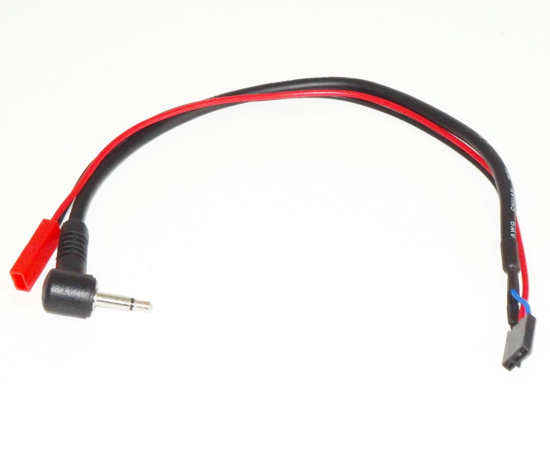 The easiest method is to connect an external LIPO of 5 - 18 volts to the power wires of this cable, this will power the Dragon Link Transmitter, and does not require you to open the back of your RC transmitter. The other method is to connect the power wires of this cable directly to the switched power inside your RC transmitter. This method will reuqire you to take the back off yoru RC transmitter and also have basic soldering skills.